USABatterysales.com. 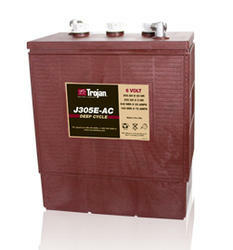 Trojan J305E-AC Deep Cycle Battery Free Delivery most locations. Trojan J305E-AC Deep Cycle Battery Free Delivery most locations. The Trojan J305E-AC batteries are sold with core exchanged at the time of the delivery. If you don't have a core the core charge is $45.00 per battery. Length 12 1/2" Width 7" Height 14 3/8".